Today, sharing content to displays via WiFi and/or the cloud using nothing more than mobile devices is expected by end users. However, it’s the technology manager who is on the line to ensure important presentations are professional and seamless. This level of content delivery is often best handled by a trained operator using hardware specifically designed to switch content sources, cameras, combine images, and more. Whether the design is for a small venue classroom, boardroom, a large venue, or an auditorium, in the end it all comes down to user needs. 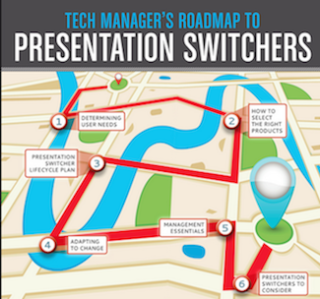 To learn more about the needs analysis process, preview new switchers, and learn from experts in the field, please download our new Tech Manager's Roadmap to Presentation Switchers.